Syria: A war with no winners, millions of losers, a threat to the entire Middle East! l targets in southern Syria, including the Daraa area adjacent to the Golan. The loud explosions could be heard in the southern section of the Israeli side of the border. Moscow has augmented its military presence in Syria and Iraq while Hezbollah, egged on intensely by Iran, has made every effort to plant its forces along the Syrian border with Israel. I wanted to give a broad picture of the chaos and the constantly shifting alliances and strategies that threaten the stability and safety of Israel. Constantly changing alliances, agreements, wins and losses overtook the effort, each time I return to the issue, I see the same insurgents, same armies, same Islamic extremists, same reports of bombings, civilian casualties, and an ever-worsening situation, much of it significant to Israel’s security! Oct. 30, 2015, the major powers moved quickly to reconvene a broad multilateral conference in Vienna to explore the situation at that time as the basis for a political blueprint for resolving the Syrian conflict. This conference was attended by the US, Russia, Saudi Arabia, Turkey, Egypt, Lebanon, the United Arab Emirates, France and the European Union. Subsequently, the UN Department of Political Affairs reported that another meeting in Vienna on November 14, 2015 of the group known as the International Syria Support Group (ISSG), the Arab League, China, Egypt, the EU, France, Germany, Iran, Iraq, Italy, Jordan, Lebanon, Oman, Qatar, Russia, Saudi Arabia, Turkey, United Arab Emirates, the United Kingdom, the United Nations, and the United States was convened to discuss “how to accelerate an end to the Syrian conflict”. And so, the world has now “progressed” through 2 more years of meetings, of high-sounding impotent diplomatic missions and “talks”, gallons of news ink and unending “news analysis”, while the blood of innocents soaks the lands of Syria, Lebanon, and Iraq, as well as of the newly carved out Kurdistan, along with that of the combatants. Meanwhile, Europe is overrun by refugees and Israeli quietly operates a medical field hospital for the Syrian wounded who can be cared for and the war goes on. “ Mazor Ladach,” whose name translates to “Bandaging Those in Need,” is a field hospital where the staff treats injured Syrians. “The clinic has already cared for hundreds of Syrians and changed their lives,” said Lt. Col. A., Commander of Operation Good Neighbor. The clinic itself is located in an uninhabited military post in the southern Golan Heights, in Israeli territory. The 210th Division helped train the staff and the clinic gradually became a real military field hospital. This site also provides a concise description of the population groups fighting as insurgents in Syria, statistics, and background for the chaos. I think it’s clear, the intensification of the war, the massive death count, and the number of refugees are in great part the responsibility of foreign intervention (including first and foremost, of course, the mass-murderers of ISIS, Al Qaeda and other Islamic extremists). I don’t know if the site editors are promoting one side or the other, but the facts are clear. I’m certain that only the militants involved can really grasp the subtle differences between the smaller internal insurgent groups. Certainly, it must be impossible for the foreign militias and armies (Iran, Turkey, Russia, US, Saudia, etc.) to bring any kind of order under their own hegemonies…..and each one of them has self-interest and military objective related to establishing their own power in the region. So where does Israel come into the mix? Primarily, they need stable, non-aggressive governments on their borders. They have to protect Israelis from their warring neighbors. This alone sets Israel against Russian, American, Iranian powers, whether directly or through the groups that they sponsor (Iran: Hezbollah in the north and terrorist groups in Gaza and Sinai). In Jerusalem, the SVR chief tried to persuade Israel’s top officials to cooperate with the de-escalation zones project that was jointly initiated by the US and Russia in Syria. The answer was no, so long as the two powers don’t act in concert to prevent Iran from establishing a military presence in Syria. Naryshkin also assured them that the Sochi summit Putin staged last week with the presidents of Iran and Turkey was not directed against Israel. This gave some of the security officials pause for thought. 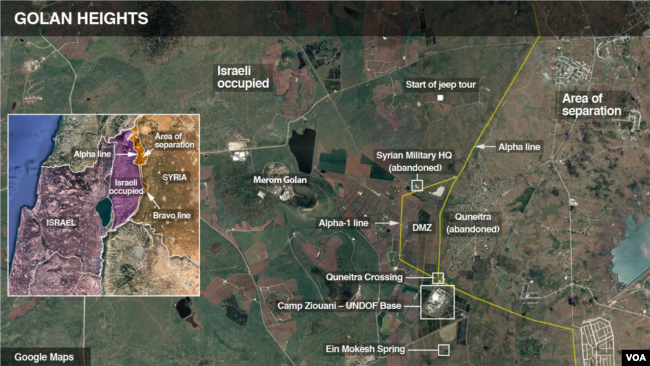 However, directly after the Russian official’s departure, word was received that Hizballah was massing troops in southern Syria inside the Daraa de-escalation zone on the Jordanian border, and appeared to be heading west towards the zone bordering Israel. You can be assured that even if Israel is now conducting pinpoint bombing raids to prevent arms shipments to Hezbollah, it will not easily be drawn into an all-out war. However, neither Iranian, Iranian supported troops, nor Hezbollah will be tolerated across the border within sight and earshot of Israeli towns and villages. So far, no one seems to be convinced that this is a life and death issue for Israel. The Soviets seem to be playing the game named for them, but Israel can’t afford to play by their rules. If Israel enters the fray, it MUST win to survive, and that, with God’s help, will make the difference.